ran out of time for our normal shots, i'm slacking! I'm at the point now where I'm losing track of which week I'm on. I'm sure it'll change when I hit 36 weeks and we're counting down. Oh third trimester, you make things so uncomfortable! If my belly is not burning, my back ribs are in pain. I hate complaining about it too. 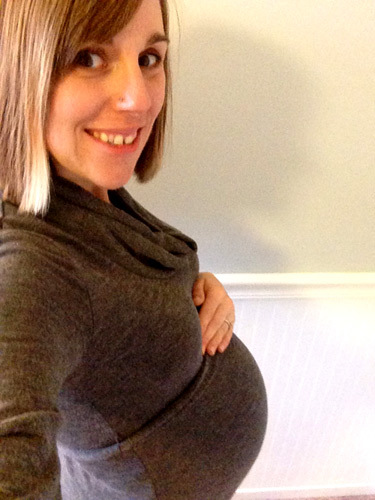 Thankfully, I am still happy and smiling and so freaking grateful to be pregnant. Today while driving to the store, I tried to breath through my pain and accept it. It actually did work! If I accept it and become comfortable with the pain, then it's not so bad. I'm really going to try working on that this week. Rob's parents drove down this weekend. We received a ginormous garbage bag filled with baby stuff! Some stuff from our friend, Rob's aunt and his parents. So awesome of everyone! We got baby clothes, blankets, some supplies and a couple stuffed animals. Also, Rob's mom gave us knitted blankets, bonnets and sweaters that his grandmother knitted when Rob was a baby. I hope that our baby will be able to wear some of the sweaters. The craftsmanship on the sweaters is so amazing. I feel so lucky that we have them. Since we got a bunch of stuff, I decided to do my first load of baby laundry. Yes, I fit everything, including linens in one load...but it was soooo much to fold! All that little teeny tiny stuff. I also learned that I shouldn't wash baby stuff on the normal settings, nor put terry cloth socks in with bibs with velcro. Some things got some loose threads and something stained a few items. Oh well. Lesson learned. Thankfully the few pieces that I really like did not get ruined. We have a doctors appointment this week. As always, looking forward to that. This week is also our last Bradley Method class, so sad! But then it's March and things are going to get crazy busy as we get things ready for baby.